There's hardly a week that passes without news of some major natural disaster. These can be extended events, such a droughts, or quick insults such as floods, earthquakes, hurricanes, tornadoes or tsunamis. While humans think that we are masters of all we survey, such natural disasters remind us that we exist on this planet only at the whim of Nature. Fortunately, these natural disasters affect small regions of the Earth, only, and none threaten all of mankind at once as did the flood in the Biblical story of Noah's Ark. Noah's near-extinction level flood might be an embellished description of an historical flood. There are many stories of such a flood in ancient literature; and, just as in Noah's scheme of saving animal species on an ark, these all explain how the Earth was repopulated. The Babylonian account of a great flood in the Gilgamesh epic tells of a man, Utnapishtim, who was instructed by his god to build an ark that also carried saved animal species. Clay tablet no. XI of the Epic of Gilgamesh in which the flood myth is inscribed. As the epic tells, "A stupor of despair went up to heaven when the god of the storm turned daylight to darkness, when he smashed the land like a cup. One whole day the tempest raged, gathering fury as it went, it poured over the people like the tides of battle..."
While Noah's ark was rectangular and Noah's flood lasted 40 days and nights, Utnapishtim's ark was square and his flood lasted just six days and seven nights. Some of Noah's flood waters came from the Earth ("fountains of the deep"), but all of Utnapishtim's water was from rain. Among the similarities in the two tales is that a release of birds was used to find land, and each ark came to rest on a mountain, Noah's on Ararat and Utnapishtim's on Nisir. The ancient Greeks had their own flood story in the tale of Deucalion and Pyrrha, mentioned by Plato (c.428 BC-c.348 BC) in his Timaeus but fully told by Ovid in his Metamorphoses. Plato places the flood at the end of the Bronze Age, and Deucalion built an ark to carry himself and his wife, Pyrrha, for nine days and nights until the ark landed atop Mount Parnassus. An oracle of the goddess, Themis, told him a method to repopulate the world. He was to throw the bones of his mother behind him. In this case, the mother was Mother Earth, and her bones were rocks. Deucalion's rocks transformed into men, and Pyrrha's rocks transformed into women, a very efficienct abiogenesis. Such repeated telling of the flood tale indicates that a natural calamity might have happened in prehistoric times. One theory is that the eruption of Thera (c. 1600 BC) might have caused a tsunami in the Mediterranean Sea. Another theory is that a meteor or comet impacted the Indian Ocean around 3000-2800 BC with the creation the 19 mile diameter (30 kilometer) Burckle Crater that also generated a huge tsunami. Three thousand years is not that distant in time, and modern humans were present. This event alone justifies the idea that we should be serious about detection and mitigation of potentially deadly asteroids, a topic that I wrote about in an earlier article (Asteroid Deflection, April 19, 2012). 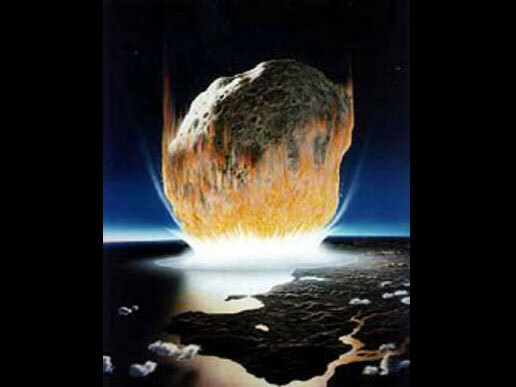 This is an artist's illustration of a suspected asteroid impact off the northwestern coast of Australia that left a 125 mile diameter crater and caused massive extinctions about 250 million years ago. There's a YouTube compilation of a 570 kilogram meteor strike at Lake Chebarkul, Russia, on February 15, 2013, that shows the power of a meteor of this small size. A recent article in Science announced the discovery of an impact crater, hidden beneath the Greenland Ice Sheet, by a huge international team of scientists. [3-4] The impact was not that long ago, during a time when modern humans were present. Members of the research team were from the University of Copenhagen (Copenhagen, Denmark), Aarhus University (Aarhus, Denmark), the Alfred Wegener Institute, Helmholtz Centre for Polar and Marine Research (Bremerhaven, Germany), the University of California, Irvine (Irvine, California), NASA Jet Propulsion Laboratory (Pasadena, California), the University of Bremen (Bremen, Germany), the University of Alaska Fairbanks (Fairbanks, Alaska), the Geological Survey of Denmark and Greenland (Copenhagen, Denmark), the Maine Mineral and Gem Museum (Bethel, Maryland), the University of Ottawa (Ottawa, Canada), the Technical University of Denmark (Kongens Lyngby, Denmark), the University of Fribourg (Fribourg, Switzerland), the University of Zurich (Zurich, Switzerland), Cardiff University (Cardiff, UK), the Université Grenoble Alpes (Grenoble, France), the University of Kansas (Lawrence, Kansas), the University of Cambridge (Cambridge, UK), the Wellcome Trust Sanger Institute (Cambridgeshire, UK), and the NASA Goddard Space Flight Center (Greenbelt, Maryland). This 31-kilometer diameter impact crater is located beneath Hiawatha Glacier in northwest Greenland, and it's evidenced by a circular bedrock depression. [3-4] It was discovered just now because of Greenland's ice cover and remote location. The crater was apparently caused by a 1.5-kilometer asteroid, thereby producing one of Earth's 25 largest-known craters. The impact is dated at about 13,000 years ago when mammoths were in decline and humans were populating North America. Geochemical analysis of glacial sediment indicates that the meteor was an iron asteroid. A map of northern Greenland marking the location of Hiawatha Glacier where the impact crater was discovered. This impact event happened just 13,000 years ago, and it acts as another warning sign that we should make a survey of potential impactors. The Solar System was a chaotic place in its early history, but there's a possibility that things are winding-down and fewer impact events can be expected. This optimistic conjecture has been disproved by recent work that shows that the impact rate has actually increased, by a factor of 2.6, about 290 million years ago. [5-6] While erosion on Earth has obliterated the record of many impact events, the Moon has been subjected to the same impact history, so it's crater record should parallel that of Earth. The lunar crater record was examined using data from the Lunar Reconnaissance Orbiter. While there have been no major meteor impacts in recent history (the 1908 Tunguska event that released the equivalent energy of several tens of megatons of TNT was large, but had only local effect), there are other natural cataclysms that have had global affect. The 1883 eruption of the Krakatoa volcano is one example. The explosion was heard up to 3,000 miles away, and its pressure wave was intense enough to circle the globe three and a half times. The volcanic ash caused the average global temperature to fall by more than 1 °C in the subsequent year, and weather patterns were disrupted for five years. For the Sun gave forth its light without brightness, like the Moon, during this whole year, and it seemed exceedingly like the Sun in eclipse, for the beams it shed were not clear nor such as it is accustomed to shed. Paul Mayewski and his colleagues at the Climate Change Institute of the University of Maine (Orono, Maine) have analyzed volcanic glass particles in an ice core drilled in 2013 in the Colle Gnifetti Glacier in the Swiss Alps. This 72 meter length core contains more than 2000 years of atmospheric sediments. Using elemental analysis by x ray excitation (XPS) they found evidence for a cataclysmic volcanic eruption early in 536. Chemical similarities points to Iceland as a likely source. The ice core analysis showed that the 536 eruption was followed by two others, in 540 and 547. Society appears to have recovered by 640 when traces of lead indicate silver smelting. The ice core data shows that silver smelting stopped at the time of the Black Death from 1349 to 1353. I wrote about the Black Death in an earlier article(Yersinia pestis, February 1, 2016). N. K. Sanders, "The Epic of Gilgamesh," Books Online, Assyrian International News Agency (www.aina.org). Meteor Hits Russia Feb 15, 2013 - Event Archive, YouTube Video by Tuvix72, February 18, 2013. Kurt H. Kjaer, Nicolaj K. Larsen, Tobias Binder, Anders A. Bjørk, Olaf Eisen, Mark A. Fahnestock, Svend Funder, Adam A. Garde, Henning Haack, Veit Helm, Michael Houmark-Nielsen, Kristian K. Kjeldsen, Shfaqat A. Khan, Horst Machguth4, Iain McDonald, Mathieu Morlighem, Jérémie Mouginot, John D. Paden, Tod E. Waight, Christian Weikusat, Eske Willerslev1. and Joseph A. MacGregor, "A large impact crater beneath Hiawatha Glacier in northwest Greenland," Science Advances, vol. 4, no. 11 (November 14, 2018), Article no. eaar8173, DOI: 10.1126/sciadv.aar8173. Paul Voosen, "Ice age impact," Science, vol. 362, no. 6416 (November 16, 2018), pp. 738-742, DOI: 10.1126/science.362.6416.738. Sara Mazrouei, Rebecca R. Ghent, William F. Bottke, Alex H. Parker, and Thomas M. Gernon, "Earth and Moon impact flux increased at the end of the Paleozoic," Science, vol. 363, no. 6424 (January 18, 2019), pp. 253-257, DOI: 10.1126/science.aar4058. Christian Koeberl, "When Earth got pummeled," Science, vol. 363, no. 6424 (January 18, 2019), pp. 224-225, DOI: 10.1126/science.aav8480. Ann Gibbons, "Eruption made 536 'the worst year to be alive'," Science, vol. 362, no. 6416 (November 16, 2018), pp. 733-734, DOI: 10.1126/science.362.6416.733. Ann Gibbons, "Why 536 was 'the worst year to be alive'," Science (November 15, 2018), doi:10.1126/science.aaw0632. Ultra-Precise Ice Core Sampling and the Explosive Cause of the Dark Ages – Mayewski & Kurbatov, University of Maine Climate Change News, December 18, 2018. Linked Keywords: Natural disaster; drought; flood; earthquake; tropical cyclone; hurricane; tornado; tsunami; human; masters of all we survey; planet; whim; Nature; Earth; Bible; Biblical; Noah's Ark; extinction event; near-extinction level; flood myth; historical flood; ancient literature; animal; species; ark; Babylon; Babylonian; Gilgamesh flood myth; Gilgamesh epic; Utnapishtim; deity; god; clay tablet; British Museum; rectangle; rectangular; square; rain; bird; continent; land; mountain; Mount Ararat; Mount Nisir; ancient Greece; ancient Greeks; Deucalion; Pyrrha of Thessaly; Plato (c.428 BC-c.348 BC); Timaeus; Ovid; Metamorphoses; Bronze Age; wife; Mount Parnassus; oracle; Greek mythology; goddess; Themis; bone; mother; Earth goddess; Mother Earth; rock (geology); man; woman; efficiency; efficienct; abiogenesis; prehistory; prehistoric times; theory; Thera eruption; Mediterranean Sea; meteorite; meteor; comet; Indian Ocean; mile; diameter; kilometer; Burckle Crater; Homo sapiens -anatomical modernity; modern humans; asteroid impact avoidance; detection and mitigation of potentially deadly asteroids; Invaders from Space (video game); artist; Bedout; northwestern coast of Australia; massive extinction; scientific literature; Science (journal); impact crater; Greenland Ice Sheet; scientist; research; University of Copenhagen (Copenhagen, Denmark); Aarhus University (Aarhus, Denmark); Alfred Wegener Institute, Helmholtz Centre for Polar and Marine Research (Bremerhaven, Germany); University of California, Irvine (Irvine, California); NASA Jet Propulsion Laboratory (Pasadena, California); University of Bremen (Bremen, Germany); University of Alaska Fairbanks (Fairbanks, Alaska); Geological Survey of Denmark and Greenland (Copenhagen, Denmark); Maine Mineral and Gem Museum (Bethel, Maryland); University of Ottawa (Ottawa, Canada); Technical University of Denmark (Kongens Lyngby, Denmark); University of Fribourg (Fribourg, Switzerland); University of Zurich (Zurich, Switzerland); Cardiff University (Cardiff, UK); Université Grenoble Alpes (Grenoble, France); University of Kansas (Lawrence, Kansas); University of Cambridge (Cambridge, UK); Wellcome Trust Sanger Institute (Cambridgeshire, UK); NASA Goddard Space Flight Center (Greenbelt, Maryland); Hiawatha Glacier; compass point name; northwest; Greenland; circle; circular; bedrock; asteroid; mammoth; North America; geochemistry; Geochemical analysis; sediment; iron; northern; survey; Wikimedia Commons; Eric Gaba; Solar System; chaos theory; chaotic; history; optimism; optimistic; conjecture; erosion; Moon; Lunar Reconnaissance Orbiter; Tunguska event; energy; TNT equivalent; megatons of TNT; volcanic eruption; Krakatoa; volcano; explosion; P-wave; pressure wave; volcanic ash; temperature; Celsius; °C; weather; 1883 Krakatoa eruption; Royal Society of Great Britain; Houghton Library, Harvard University 71-1250; chronicle; 6th century; extreme weather events of 535-536; science; scientific; Byzantine Empire; Byzantine; historian; Procopius (c.500 - c.554); History of the Wars, Book IV, Chapter XIV; Europe; Middle East; Asia; mystery; mysterious; fog; growth ring; tree ring; climate; summer; decade; bubonic plague; Plague of Justinian; world population; Roman Empire; Paul Mayewski; colleague; Climate Change Institute; University of Maine (Orono, Maine); volcanic glass; particle; ice core; core drill; drilled; Colle Gnifetti Glacier; Swiss Alps; meter; atmospheric sediment; X-ray photoelectron spectroscopy; elemental analysis by x ray excitation; XPS; Iceland; timeline; insolation; weather; crop failure; plague; Inkscape; society; lead; silver; smelting; Black Death; Y pestis. Copyright © 2019 Tikalon LLC, All Rights Reserved. Thanks to Cory Doctorow of BoingBoing for his favorable review of Secret Codes!